SAN DIEGO, Calif., August 27, 2012 - Enterprise email service provider BlueHornet recently partnered with Cuker to energize their brand identity and messaging with a redesigned website. The new www.BlueHornet.com stands out from the stoic crowd of B2B service providers with an updated image that uses warm, personable hues and graphics to visually engage prospective clients. BlueHornet turned to Cuker for a complete rebranding of their online presence, in search of a way to visually communicate the company’s friendly culture and focus on customer service. BlueHornet manages each client’s email service with a personal touch through Support2, the industry’s only two-tiered model for collaboratively managed accounts. The Support2 model provides each account with both an account manager and coordinator, guaranteeing that a dedicated team with in-depth knowledge of the client’s business is always available and offering ongoing proactive support. Despite their personal attention to clients, BlueHornet’s previous brand image was too clinical and formal to effectively communicate the company’s top notch client services. 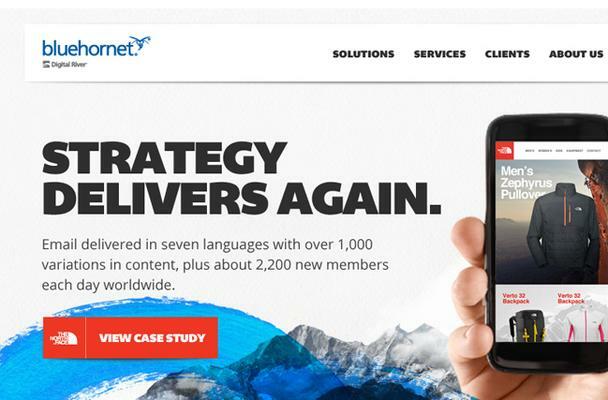 The Cuker team infused more fun and personality into the new www.BlueHornet.com by redesigning the homepage, “about us,” and client pages with a vibrant and colorful look, while also maintaining a professional image. Cuker’s complete brand overhaul included competitive and market analysis, a new positioning statement, and updated copy, typography, and brand elements. BlueHornet’s new open-ended tagline, “We Deliver Email ____,” allows the company to extend their brand messaging in a number of directions, communicating everything from their email results to clients’ success stories.